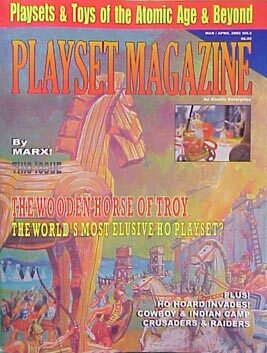 Issue 2 - The Wooden Horse of Troy! 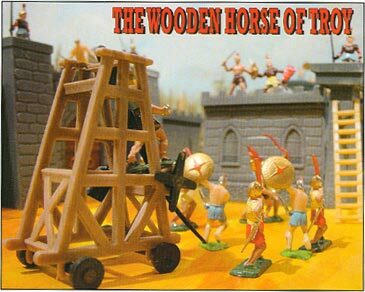 one-of-a-kind WOODEN HORSE OF TROY playset, long thought to be just another Marx Myth. Complete with two never before seen armies the walled city of Troy and a unique Wooden Horse, the FULL COLOR CENTERSPREAD is not to be missed. dismounted Rebs and Yankees, Italerie, Stark's Raving Mad Puzzler and more. Marx cowboy and Indian Camp, Replicant's new Civil War dismounted Rebs and Yankees, Italerie, Stark's Raving Mad Puzzler and more. We've also got lots of ads for new and vintage sets including the incredible new CTS ARMY COMBAT set in blazing FULL COLOR! Don't miss another issue - subscribe today!